It's about time we all call a truce with our bodies. In pursuit of a "healthier" body, somehow we ended up feeling a lot unhappier in our bodies than ever before. Diets are really good at one thing: promising you your dream results, pronto. I can't promise you that. By the end of this course you'll have the knowledge and tools necessary to feel more intuitive about your needs, more confident in your body and way less obsessed about food. 99% of the time, dieting does more harm to your body and mind than good. The three biggest pitfalls of dieting? Weight cycling leads to an increase in your set-point weight,the natural weight your body is happiest + healthiest at. Dieting strips your ability to intuitively make decisions that honor your health. Your body innately knows what, when and how much to eat to feel it's best; it's when you start following any sort of dieting rules that that instinctual ability to eat "normally" wears down. So yeah- It's time for some fresh perspective. My approach is not to dwell on calories, carbs, fats, or proteins. t is not to create lists of restrictions of "good" and "bad" foods. And it is not to tell you about the next best workout routine that's going to change your life. Those are all just distractions keeping you from digging any deeper than surface level. My job is to help you air out all the stuff that's lying underneath your desire to inhabit a different body. Body positivity is the destination. 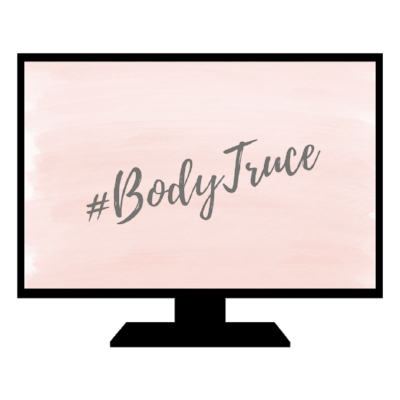 #BodyTruce is the vehicle. This 4 month course is about waving a little white flag to your body; it's about letting your internal hungers (and I'm not just talking the physical ones!) guide you into health rather than relying on external sources to tell you what, when and how to eat or move. When you call a truce with your body you're making it known that you're ready to feel good in your body- but this time on your own terms. You know- all those awful new diets you've tried? Yeah, those are going bye-bye. You'll figure out how to listen to what your body wants and needs without rules and restrictions. It IS possible, I promise. Gone are the days when you try on 12 different outfits in the morning just so as not to feel "fat". We'll work through some of your biggest issues with your body and structure new ways to help you show it some love. Do you often feel like it's a struggle to just be around food? You feel like you're either completely in control or you're spiraling into a full blown 'sitting on the floor of the pantry' binge. In this course you'll learn how to feel normal around food again so that you can actually enjoy eating without overthinking it. Up until now, how many of your New Years resolutions have been about losing weight or exercising more? That's all well and good IF you're really clear and honest about why you want those things. We're going to dial it all back, narrow in on your WHY and then rewrite your goals (in health + life!) to honor that deeper intention. I used to spend hours in the kitchen every week planning, prepping and obsessing. Everything was perfectly calculated and at the end of it all I felt starved, obsessed, and to be honest a little crazy. I've also been on the other side of it- no planning, no prepping and ending up eating freezer meals and dry goods for weeks on end. I'll show you how to meet yourself in the middle when it comes to cooking and food preparation, with Gentle Nutrition. I want to amp up the quality of your life without adding another 'to-do' to your plate. All of the lessons, videos, worksheets and resources are housed online so that you can do the course at your own pace. Meetings will be recorded and shared so you'll never miss a beat if you can't make it live! Plus you still get that little nudge from yours truly once a week to keep moving forward. Make sure you're signed up for course details next time Body Truce is available! for download, customized specifically for this course to keep you motivated and anchored to your commitment- great as a screensaver, on your mirror or taped in your notebook! where we talk goals, habits, health concerns, your relationship with food and your body- and at the end, celebrate all your progress like it's 1995! online support between sessions from both me and the group- hello accountability! We dive in with a fury and get down to: why dieting hasn't worked and why it never will, exactly how you're going to get to your body's natural happy place and pinpoint your eating style- yes this is a thing + it totally matters! It's important to really get to know your WHY before we get to the guts of this course, so we'll spend some time exploring what is and isn't going to work for you and get to the stripped down version of your goals. This is when we get down to major business, my dear. Each week you'll get new lessons and assignments focussed around one principle at a time. We begin with learning to follow your hunger cues, granting permission around fear foods, and finish with an introduction to Gentle Nutrition and intuitive cooking. In the final weeks you'll learn the basics of Gentle Nutrition and how to start nourishing yourself without falling back into old dieting patterns. You'll learn how to keep meal prepping fun, simple and intuitive- without spending hours in the kitchen! Your weekly assignments will involve playing with what eating "healthy" looks like for you, and testing out these new practices in your own kitchen. We focus on taste, quality and quantity versus counting macronutrients or eliminating certain foods. We wrap the course up with setting fresh intentions, creating systems for support and DIYing your own pleasure plan! *Assignments may take shape in the form of written worksheets, private journal work, conscious habit change, eating experiments and self-designed creative projects and should take no more than 1 hour per week. So what do you say, my dear? Are you ready to call a TRUCE with your body? pssssst- there are early bird exclusives, always. Make sure you don't miss out on those. Are you ready to call a truce? Registration is currently closed, but I am taking applications for next time. Make sure you're on the VIP list for the next session, this Fall.